I love crossovers (where something or someone from one story appears in another story), both when it comes to reading or seeing them in other people’s works and writing them myself. Crossovers can range from being so small that you barely even notice them (eg: as an in-joke or a background detail in a comic) or they can be the basis for an entire story (such as the excellent “Star Trek: The Next Generation”/”Doctor Who” crossover comic). However, they can sometimes be difficult to write well and it can be difficult to know when and when not to include them. 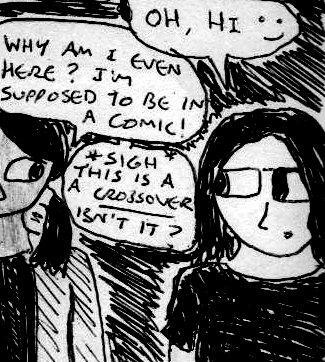 They turn up surprisingly often in my work and there are numerous crossovers with my other comics in “Somnium” and even episode four of “CRIT” was basically just a geeky excuse to write a crossover story with an unpublished sci-fi story I wrote in 2009. Not to mention that the title illustration for this article also includes Suzy from “CRIT” too. I could devote an entire article or series of articles to listing all of the crossovers in my comics and stories, but I might save that for another time. After all, this article is about helping you to write your own crossovers. This article will focus on writing crossovers between your own stories rather than crossovers with other people’s stories. Whilst some very small crossovers with other people’s work in your own published may be covered by “fair use” and/or “fair dealing” exemptions in some countries, this is quite a complicated subject from all I’ve read about it. Larger crossovers with or between other people’s work are probably likely to be ok most of the time in non-profit fan fiction or fan art which is properly labelled as such though. However, for both creative and legal reasons I’ll be focusing exclusively on crossovers between your own stories. There are ways to use other characters from other stories, for example if they’re from works which are out of copyright (eg: “Alice in Wonderland”, “Dracula” etc…) or if a character is clearly a parody of a character from another story (but has a different name and appearence) or if a character from another story is only alluded to briefly but never really named or shown. But, even so, I’ll only be focusing on crossovers between your own stories for artistic/creative reasons. One benefit of adding crossovers to your story is that it subtly introduces your other stories to new readers and it is also a fun bonus (but hopefully not a service…) for fans of your other work too. Plus, crossovers are fun to write, in fact they’re either an essential part of or a natural extension of geeking out about your stories. As well as this, crossovers also contain a sense of connection between your works. This helps the reader, as well as you, to see your entire body of work as a single thing with lots of different parts to it. The human brain works by making connections between neurones (or is it neurites or neurons? I’m really not sure), imagination often works by connecting two different ideas and the internet works through connections too (both between sites and between users). Connection is a basic part of humanity. Crossovers are connections. 1) Sometimes “less is more” if your stories are very different: This is a good rule to follow with crossovers. If it isn’t appropriate to the general tone and storyline of your story, then it can be better to make your crossover quite subtle and small. Just have your other character standing in the background, or a memorable object from your other story appear briefly in one of the settings or have another character briefly mention or refer to (either directly or indirectly) something or someone from one of your other stories, without showing it. This works best if you’re writing a crossover between two stories in very different genres or vastly different fictional universes. For example, having a character from your serious contemporary police procedural stories appear in your historical fiction stories about 16th century Europe would look incredibly contrived. There are, of course, ways of writing these kind of storylines, but on the whole, they only really work as novelty storylines, non-canon storylines and/or if they’re played for laughs. However, you can use it for serious stories if you’re really clever about it. Going back to my earlier example, a good way to do a “serious” crossover between those two stories would be to have the protagonist in your realistic detective story (and I’m going to assume that it’s set in America, because many of the famous “police procedural” TV shows are usually set there) being called out to investigate a murder at a Renaissance fair where either the victim and/or the suspects bear an uncanny resemblence to the characters from your historical fiction stories, even though they’re technically different people. In short, if your stories are very different – then you have to either play it for laughs, be very subtle or be very clever about how you write it. 2) Know your characters very well: This is essential for storytelling in general, but it’s even more important when you’re writing a crossover. One of the main appeals of reading crossovers is that you get to see how characters from different stories would get on with each other if they ever met. This means that you, the writer, have to have a very good sense of who your characters are and what their personalities are. If your characters suddenly start acting out of character during a crossover, then this can be extremely noticeable. If you do this well, then it also helps to add characterisation to both of your characters at the same time and you can use it to subtly reveal things about one or both characters which may have been more dififcult or incongruous to reveal in each character’s induvidual storyline. Again, this can either be done seriously or for laughs or both. 3) Stories with crossovers should still work as standalone stories: What I mean by this is that a reader who has never read any of your other stories should still be able to understand and appreciate your crossover story. This may sound fairly simple, but ignoring this can confuse and alienate some of your newer readers. However, there are quite a few ways around this. Either make your crossovers small enough so that they won’t really be noticed by new readers or give a small amount of background for the character from your other story if they’re a main character in your crossover. This doesn’t have to be their entire life story, but it should briefly give a new reader a sense of who they are and why they’re in your story. This can be done either by having the other character introduce themseleves or having the characters from your story briefly talk about the other character. Or some of the other character’s backstory can be briefly mentioned via dialogue with the main characters later in the story. This can also be done by either pretty much just presenting the other character as a new character or by making their personality obvious from the context of the storyline. For example, in part of the first volume [“Preludes and Nocturnes“] of Neil Gaiman’s excellent “Sandman” comics, the main character needs to find a bag of magical sand which he has lost several decades earlier. In the end, he enlists the help of a private detective who specialises in the occult. This private detective wears a trenchcoat, is reasonably cynical and smokes like a chimney. His name is John Constantine. If you didn’t know this last fact, it’d still work very well as a standalone story – but fans of “Hellblazer” (which, regrettably, I’ve only ever read a couple of issues of) would instantly recognise this as a crossover. By doing this, Neil Gaiman is adding something for “Hellblazer” fans, whilst still ensuring that people who have never heard of it before won’t end up being totally confused by this storyline. 4) Have a small motif or common object in many of your stories: This is an extremely subtle type of crossover, but it can work if you’re writing lots of very different stories or if a character-based crossover wouldn’t really be appropriate. It’s something which your fans can have fun finding and it’s something which marks your stories as being yours. This doesn’t have to be anything major, in fact it works best if it’s something totally mundane (but with a rather distinctive name), but it provides a very subtle sense of connection and continuity between your works as a whole. Plus, it’s just good fun to do too. Some examples from my own comics and (mostly unpublished) fiction include Tangerine Frost [an orange ice-based drink, occasionally with vodka], a heavy metal band called “Twilight’s Requiem” and an old book called “The Forgotten Art of Oneiromancy”. These don’t have to appear in literally every one of your stories (if it doesn’t fit into the context of your story) and it’s usually good to have at least a couple of them to choose from, but it can be a fun way to add your “signature” to your work. Anyway, if you didn’t already know this stuff, then I hope that this helps you to add crossovers to your work. If they’re done well, then crossovers can be a real treat for both you and your readers. This entry was posted in Comics, Writing and tagged Comics, creativity, CRIT, crossover, geek, how to, writing.